The Nissan Titan XD will arrive late this year. Four big model splashes will dominate Nissan Division's product rollouts for the next 12 months. The changes are intended to bolster the performance of two of Nissan's highest-volume products, the Altima and Sentra, while lifting two others, the Titan and Armada, into high-volume status. The first introduction is a heavier-than-normal midcycle freshening of the brand's sales-leading Altima sedan this fall. On its heels will come another significant freshening -- the Sentra sedan for 2016. That model was just redesigned for 2013. 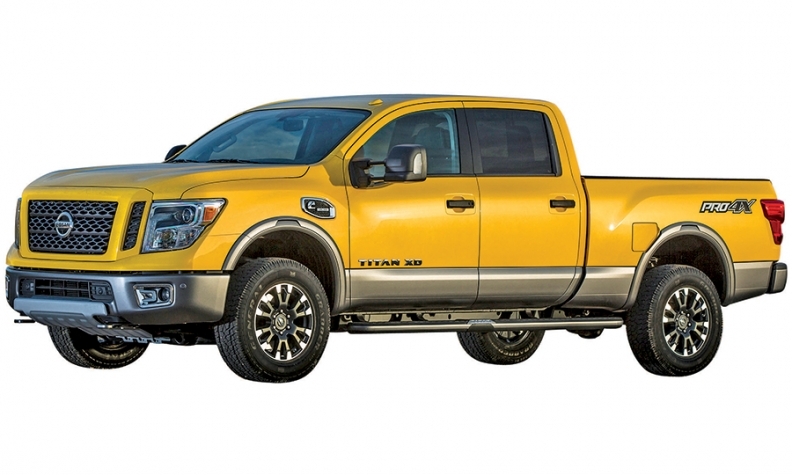 For the second wave, a redesigned 2016 full-size Titan pickup will arrive late in the fourth quarter of this year, with various model configurations rolling out during 2016. A redesigned full-size Armada will follow the Titan next year. But unlike the outgoing Armada, built on the Titan truck platform on the same assembly line in Canton, Miss., the new-generation Armada will move to the global Japanese-built Patrol SUV platform and bear design similarities to the luxury-class Infiniti QX80 SUV. Nissan also is preparing to introduce a hybrid version of its popular Rogue crossover late this year or early next year, according to sources familiar with the automaker's plans. Nissan Division's mission to capture 10 percent of the U.S. auto market by early 2017 -- up from 7.9 percent for the first half of 2015 -- is shaping the brand's product portfolio. Marginal, low-volume image-oriented models such as the Cube and the convertible Murano CrossCabriolet have fallen by the wayside as Nissan pushes for more U.S. volume. And greater attention is being placed on models with mass-market appeal, such as the updated Sentra. Titan: Nissan is planning big for the long-overdue second generation of its full-size pickup. Late this year, the first version will appear as the Titan XD, equipped with a 5.0-liter, turbocharged V-8 diesel, promising 310 hp, 555 pounds-feet of torque and a 12,000-pound towing capacity. A series of other Titan configurations will follow in 2016, including gas V-8 and V-6 engine packages and crew cab, king cab and single cab variations. The Titan will come in three cargo bed lengths with two- and four-wheel-drive options. Armada: The next generation of the full-size SUV will be produced in the first half of 2016 on the same architecture as the Japanese-built Nissan Patrol and Infiniti QX80 full-size SUV, according to sources familiar with Nissan's product plans. Despite efforts to separate the Nissan and Infiniti brands, the twin SUV imports will bear a strong resemblance and share many of the same exterior features. High-end interior components, down to their wood trim, will be shared between the QX80 and the Armada. 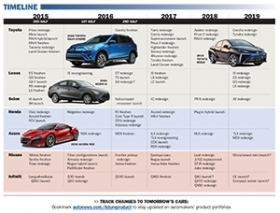 Altima: Three years after its 2013 model year redesign, the 2016 Altima will receive a significant freshening this fall. The sedan will get new body panels and an updated front end, as well as a new generation of technology. Sentra: The compact Sentra also gets a major freshening for 2016, three years into its model cycle. Expect acceleration refinements, fuel economy improvements and safety enhancements. Leaf: The electric Leaf's driving range will expand for 2016, with a 30-kilowatt-hour battery delivering between 110 and 125 miles per full charge, compared with its current EPA-rated range of 84 miles. But an even bigger performance gain is coming with the Leaf's 2018 redesign, according to a person familiar with the project. A battery-power system is being developed that could give the new generation more than 300 miles of driving range. Rogue: The compact crossover receives emergency forward braking for the 2016 model year and discontinues its previous-generation Rogue Select model option. Nissan also is planning two new Rogue variants -- a hybrid Rogue, scheduled for late this year or early 2016, and the Rogue's European Qashqai sister version, which will arrive in the U.S. in early 2017 and serve as a smaller, lower price-point Rogue. The Qashqai is approximately 10 inches shorter than the U.S. Rogue and slightly narrower, with less rear cargo space. But the European version also delivers better fuel economy. The 1.6-liter gas engine package claims the equivalent of 53 mpg. Frontier: The midsize Frontier pickup is due for a redesign in the coming calendar year, falling in behind redesigned segment competitors from Toyota and General Motors. Nissan's new generation of the Frontier's NP300 truck platform has been unveiled in Latin America and Thailand, where it sells as the Navara. Nissan has hinted at the availability of a 2.8-liter turbo-diesel engine in the upcoming U.S. version of the Frontier -- and in fact, the version that is now headed to Latin America uses a turbo diesel. 370Z: Nissan is in no hurry to bring out its replacement for the 370Z -- a redesign is not likely to appear before the end of 2017. But over the last two years, Nissan executives have been consistent in saying that the next Z will be smaller, lighter and nimbler than the current sports car. That likely will translate to a smaller engine that's turbocharged to make up for the smaller displacement. GT-R: Nissan has issued styling, performance and technology updates on its supercar almost annually since it arrived in the U.S. in 2008. The GT-R is due for a major redesign in 2018. Company hints about its direction indicate there will be no surprising changes in the next generation of its architecture. Juke: Heavily tweaked for a fall 2014 freshening, the polarizing Juke is not due for a full redesign until 2018 or later. Nissan has hinted that the next design iteration will be even more strident, rather than toned-down. Pathfinder: The midsize crossover will receive a freshening next year. Nissan discontinued the Pathfinder Hybrid for 2016. Versa, Versa Note: A leader in the subcompact-car segment. It will receive a freshening for the 2017 model year, followed by a freshening of the Note a year later. Maxima: The four-door sport sedan arrived for its eighth generation in early summer as a redesigned 2016. Murano: Redesigned for a late 2014 showroom debut, the current Murano will carry over for several years. Quest: The roomy minivan is a problem child for Nissan, as minivans have gone soft for the industry in general. While Quest sales provide Nissan dealers with better than average retail margins, Nissan has little motivation to invest in future design changes for now. The current model was introduced in early 2011. Xterra: The truck-based midsize SUV faces certain death after 2017. Although it remains a hip pick for a declining fan base of off-road customers, the Xterra's heavy body-on-frame architecture makes it difficult to adapt to stringent federal fuel-economy rules. And low sales of the once-popular nameplate make new investments for looming federal safety standards impractical. Micra: Nissan continues to study the below-Versa small-car segment for the U.S., probably for 2018 or later. The global Micra has been well-received in Canada for its first sales year there. In March, Nissan unveiled a sporty subcompact hatchback concept in Geneva called the Sway, which sources said could be the path for bringing the Micra platform into U.S. showrooms. A key consideration for such a move would be finding -- or constructing -- the necessary factory capacity to build it.